In the Big Sky plains of southeastern Montana lie several post offices along a lonely artery: U.S. 212, which winds its way through hundreds of miles of rural landscape from the Little Bighorn Battlefield along I-90 through to Minneapolis, by way of Wyoming and the entire width of South Dakota. 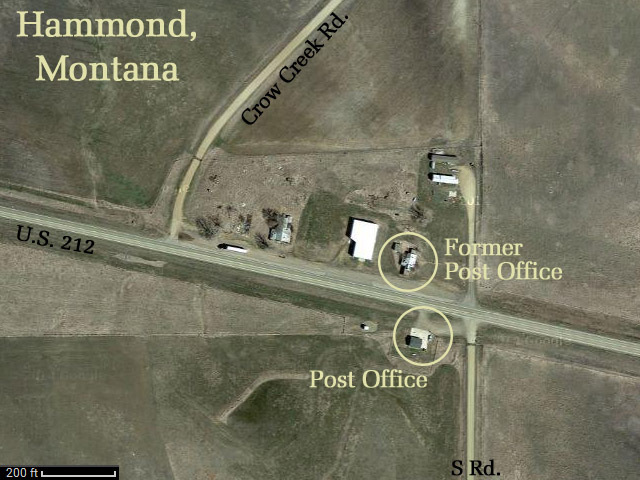 Along the 60-mile stretch of the road in Montana southeast of the town of Broadus, a county seat, lie three post offices: Boyes, Hammond, and Arzada. 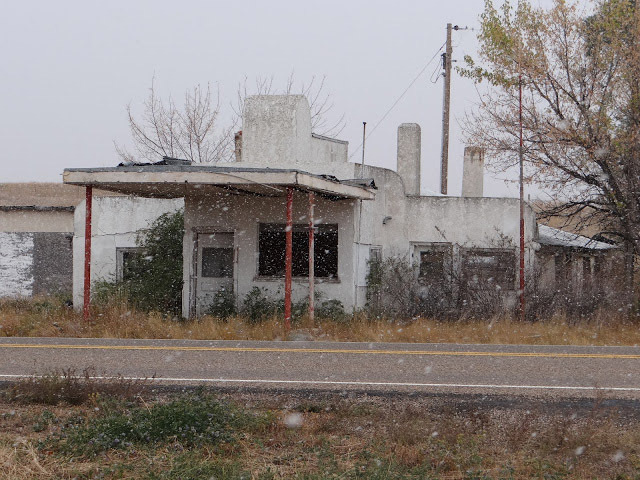 When I say post offices lie along the road I don't mean that you'll see towns; you may see three or four buildings along a road, one of which is a functioning post office. The speed limit doesn't even drop at these points. Blink and you will miss them. 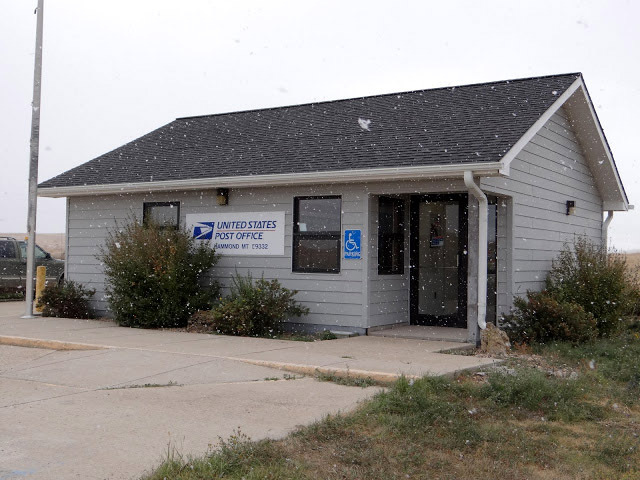 Since there are no addresses in the community, USPS's Leased Facility Report states a rather unusual address for the post office: "S OF HIGHWAY 212". To be fair, this is actually the only structure on the south side of Highway 212 in Hammond. The post office was purpose-built (date unknown; missing from USPS Leased Facilities Report) on a 10,000-square-foot plot owned by a local landowner (address: a P.O. box) for the modest sum of $1,825 per year. The Hammond and Boyes post offices are oddities: due to the fact that either a) their workload surpasses four hours a day or b) they happen to be far enough away from the nearest larger post office, each now rates as a six-hour facility under USPS's POStPlan. While thousands of post offices have had their hours reduced across the country, these two post office actually increased from four-hour-a-day to six-hour-a-day operations! The design of the post office building itself is standard for a class of generic small post office buildings constructed several years back before the Big Sky District of USPS had been consolidated into the Dakotas District. Standard size, standard layout, standard colors, standard signage. Sadly, this means that the remote post offices in this corner of the country are not the most photogenic. However, look across the street (i.e., to the north side of Highway 212) and you will see what I love to find: the former site of the post office, uninhabited but authentic through and through.